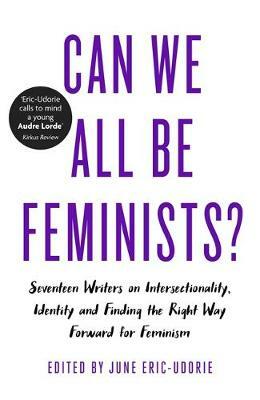 'The intersectional feminist anthology we all need to read' (Bustle) edited by a remarkable and inspiring twenty-year-old activist who the BBC named one of 100 'inspirational and influential women' of 2016. Including essays by: Soofiya Andry, Gabrielle Bellot, Caitlin Cruz, Nicole Dennis-Benn, Brit Bennett, Evette Dionne, Aisha Gani, Afua Hirsch, Juliet Jacques, Wei Ming Kam, Mariya Karimjee, Eishar Kaur, Emer O'Toole, Frances Ryan, Zoe Samudzi, Charlotte Shane and Selina Thompson. June Eric-Udorie is a twenty-year-old writer and feminist activist. Named Elle UK's "Female Activist of the Year" for 2017, she has been included on lists of influential and inspiring women by the BBC, the Guardian, and more. A co-founder of "Youth for Change", an initiative that works to combat female genital mutilation and forced marriage around the world, her advocacy has taken her to classrooms, the Women of the World Festival, the United Nations, and more. In 2015, she spearheaded a successful campaign to overturn the British government's decision to remove feminism from the nationally mandated A-level (high school) politics syllabus; more recently, she raised funds to take five hundred underprivileged girls and young women of color to see the film Hidden Figures. Her writing has appeared in the Guardian, the Independent, New Statesman, the Telegraph, ESPN The Magazine, and Fusion, among others. She is currently in her first year at Duke University, where she is a recipient of the University Scholars merit scholarship, established by Melinda French Gates, and a Human Rights Scholar at the Kenan Institute for Ethics. Follow her on Twitter @juneericudorie.